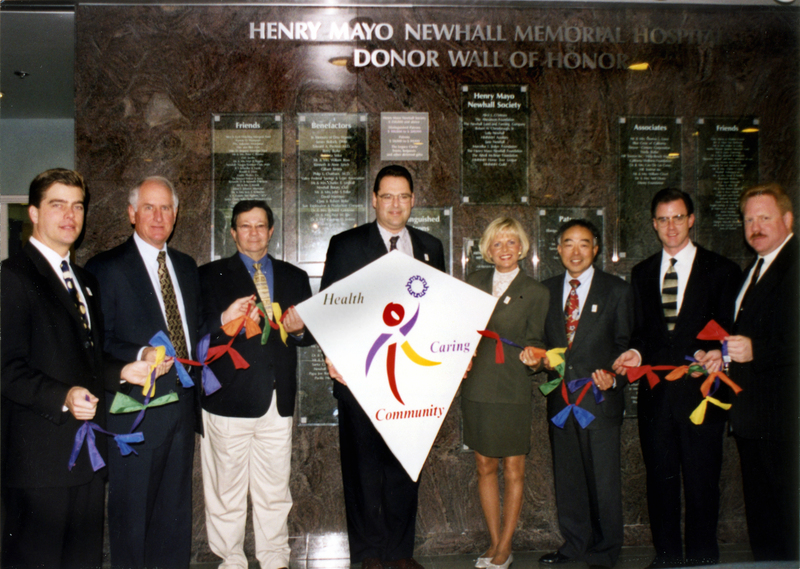 September 3, 1998 — Members of Henry Mayo Newhall Memorial Hospital's capital campaign committee cut the ribbon to the new Donor Wall of Honor in the lobby of the main hospital building in Valencia. From left: Craig Peters, Gary Cusumano, Tom Veloz, Tom Pilgrim, Cheri Fleming, Alan Kanase, Robert Scanlan, Tadd Russikoff (VP, Valley Crest Tree Co.). Four and a half years after the Northridge earthquake did $30 million worth of damage to the hospital, the glass and granite wall listed the names of 232 companies and individuals who contributed at least $1,000 to the reconstruction effort. Initial cost estimates were $20 million, but the price tag rose in part because officials made the decision to extend the reconstruction timeline to minimize the disruption to patients in the 223-bed hospital, rather than shut the facility and do it all at once, according to Lisa Foust, then-president of the Henry Mayo Newhall Memorial Health Foundation. The original 1975 and 1983 buildings were brought up to current seismic standards, and new handicapped-accessible features were added at the same time to meet new requirements that had gone into effect. FEMA covered about half of the cost; the rest was up to the hospital and its donors. HM9801: 19200 dpi jpeg from original 5x7-inch photograph.